Rug Grippers X-PROTECTOR – Best 8 pcs Anti Curling Rug Gripper. Premium Carpet Gripper with Renewable Gripper Tape – Ideal Anti Slip Rug Pad for Your Rugs. MADE FOR LONG SERVICE - anti-curling grippers have PREMIUM QUALITY and RENEWABLE STICKY SURFACE. This is a quality product! This is a quality product. I rarely leave reviews but I decided to leave one as this is a great product. You can even tell by the packaging that this is well made. Easy to open, clear instructions etc. And it works great! This is a quality product that we use and I would buy again. We got these grippers a few weeks ago and are so glad we ordered them. They´re super easy to apply and hold the corners of our runners down way better than anything else we tried. I had to move one of runners today while a construction job is done and while the grippers grip the floor really, really well, like I had to pry them off I was afraid I was going to scratch our flooring, that´s how well they grip! But nothing happened to the flooring and there was absolutely no stickiness on the floor, as well. I’ve only had these down for a week, in a house with 2 boys and 2 large dogs, and so far they’re working great. I got them for a 14-foot hallway runner and they hold perfectly. I have “re-adjusted” the rug a few times and it sticks right back down and doesn’t slip at all. We’ll see how long they continue to work for, but the fact that you can just wipe them off and re-use was very appealing to me. Fast delivery and the product was exactly what I expected! Bought this not because of my rug curls, but because it slides all over the floor. 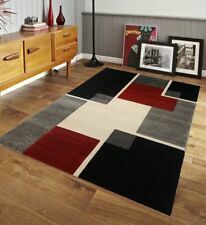 I have very pretty rugs in my hall and guest bathroom that has a tile floor. My old crummy rug did not move much but was ugly. My new rug is so pretty but travels a lot. I placed these grippers, one on each corner and the rug has not moved in a week of use. Besides, it was enough in a package even for one more rug inside the front door, which also sits on a tile entryway.